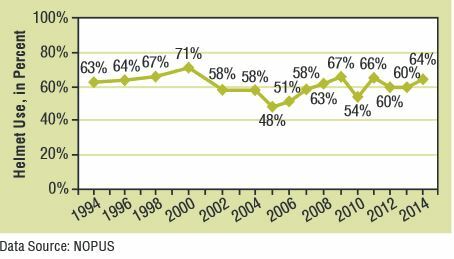 DOT-compliant helmet use was 64%, an increase from 60% in 2013. Use of non-compliant helmets decreased to 5%, down from 7% in 2013. Motorcyclists who did not use a helmet decreased to 31%, down from 33% in 2013. Nineteen (19) states and the District of Columbia require helmet use for all riders. Helmet use increased significantly in the southern states. NHTSA has documented that motorcycle helmet usage has varied over the years as shown in this graph. 830 Engineering is a forensic engineering firm that completes motorcycle crash investigations, motorcycle crash reconstruction, vehicle crash investigations and vehicle crash reconstruction. Erin Higinbotham, P.E. is a motorcycle expert and vehicle expert.